Zhua Zhou – Picking the Future! Earlier this month we celebrated our son Nathan’s first birthday. Like most one year olds, Nathan doesn’t get too excited about cake. His sister Josie also wasn’t too thrilled about the cake, either. For some strange reason the Lightning McQueen cake we ordered turned out pink instead of red, leaving her highly disappointed. We prepared a tray of objects for Nathan’s Zhua Zhou [抓周]. 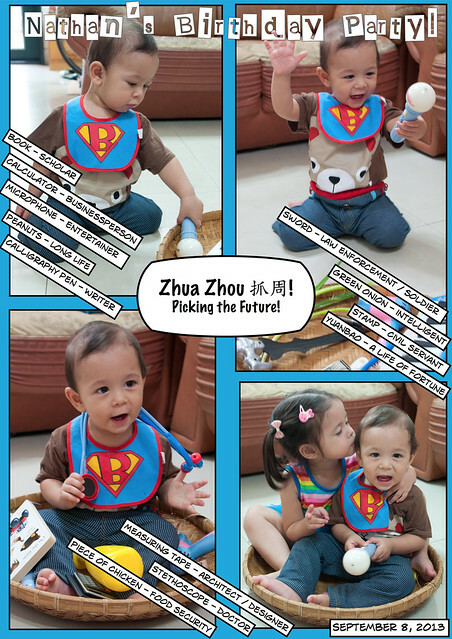 Zhua Zhou [which literally translates to “pick” and “anniversary”] is an activity held on a child’s first birthday. In the activity, objects are placed on a tray and the object a child picks can indicate his or her future career and personality traits. Our son picked up the microphone first and played briefly with a few other objects before we threw his sister onto the tray. No matter what object he started playing with he always went back to the microphone. Despite the best efforts of my mother-in-law to get him to hold the yuanbao [元寶] long enough for a photo he always tossed it aside to grab his microphone. What a cutie. 🙂 Happy birthday, Nathan!! I came across your blog searching for info about Taiwan as we are hoping to adopt a girl from Taiwan. Thanks for all of the great posts! Thank you! Best of luck on the adoption process! What an interesting tradition. Happy birthday to your son! Thanks! This is right up there with the Anti-Drooling Ceremony! Thanks Olivia! My life’s been hectic too! Hence the several months without posting.